Honestly, I don’t think we would have ever gone to Košice if we hadn’t found a super-cheap flight back home to Istanbul. We knew very little about the eastern Slovakian city before we went; but, in the end, we were happy to have done so. It was the best way to end our trip across Central Europe. We got to Košice by train from Bratislava, crossing nearly all of Slovakia from west to east. The five-hour journey was enhanced by the spectacular views dashing out the windows: green pastures dotted by livestock, patches of cultivated fields, remote villages and pristine lakes framed by the imposing peaks of the Tatra Mountains in the background, their beauty tempting us to get off at one of the tiny stations en route and get lost in the countryside. Hard to argue with this ride into town. With a population of just over 240,000, Košice is Slovakia’s second largest city. After visiting Bratislava, the quiet capital, we knew we would find a laid-back atmosphere closer resembling a town than a metropolis. This was in July, with most of the student population gone and nearly no tourists around, so Košice was even quieter than Bratislava, which was great for us—we just wanted to recharge our batteries and relax before returning to chaotic Istanbul. Košice’s beautifully preserved old town is the perfect place to chill out: clean air, tree-lined cobbled streets, small but well-kept parks, statues and fountains, pretty cafés and bistros and, especially, a tight concentration of stunning architecture. This should not come as a surprise, given the long and rich history of the city; dating back to the 13th century, Košice was the first European city to be granted a coat of arms, in 1369, and for centuries was a gateway between east and west. The singing fountain in Košice’s Main Square, where the colours change with the music it plays. 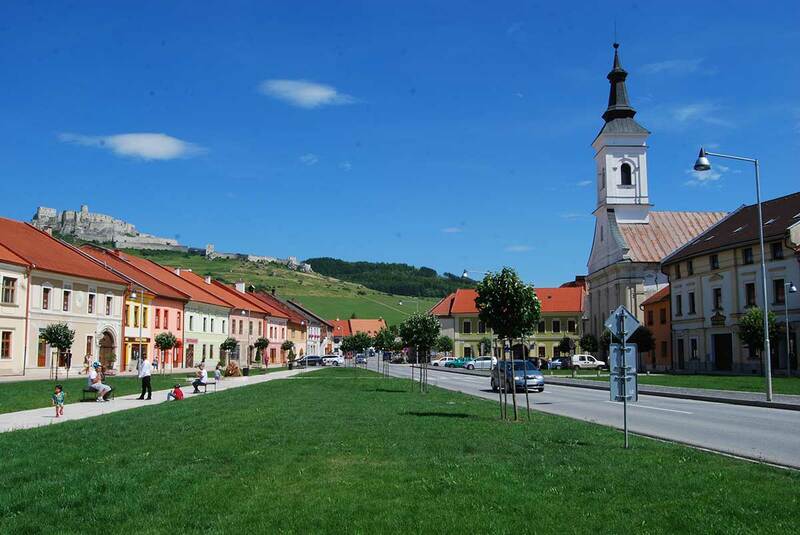 Most of the city’s landmarks are located along or in the immediate proximity of the main street, Hlavná Ulica. The Old Town Hall, the Baroque Church of the Holy Trinity, the Neo-Baroque State Theatre and the Neo-Gothic Jakabov Palace are all near Hlavná Ulica—but, in fact, wherever you look, you will see something beautiful. 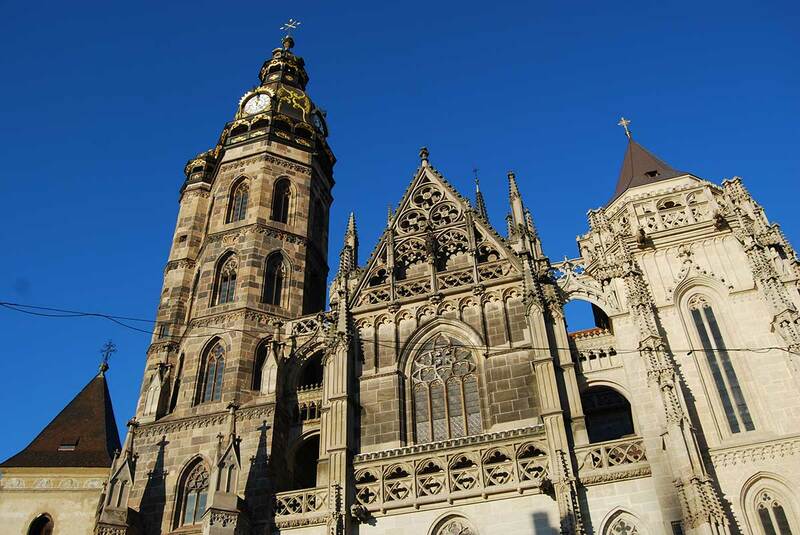 The most impressive and famous monument, however, is undoubtedly St. Elisabeth’s Cathedral. Completed in the 16th century, it is the biggest cathedral in Slovakia and the easternmost Gothic church in Europe. St. Elisabeth’s Cathedral, one of Košice’s most stunning pieces of architecture. 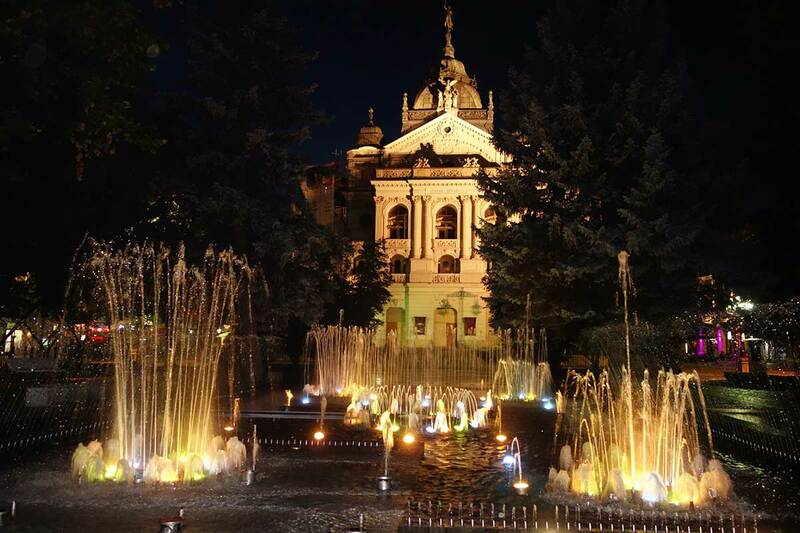 Our favorite spot in Košice was a small park called Hlavné Námestie, or “Main Square,” delimited by the cathedral and the Urban Tower on one side, and the State Theatre on the other, where we were mesmerized by a singing fountain, and found ourselves staring endlessly at the water gushing and dancing to the rhythm of music. I should not fail to mention that the culinary scene in Košice is pretty amazing. The coffee and bistro culture is well developed, and whatever you eat is generally homemade with local ingredients. As is typical in Slovakia, beer and wine are incredibly cheap and delicious. Although the centre is full of good restaurants, be wary: kitchens close quite early here. All Angeliki and I could find after nine o’clock was reheated takeaway pizza slices! 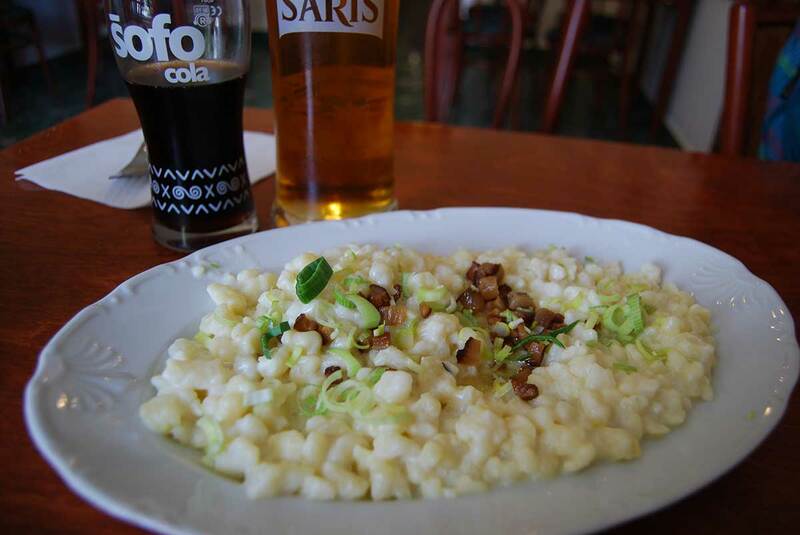 When chowing down in Slovakia, don’t forget the specialty beer! Lured by the landscape we had cherished on the train, we decided to spend our last day tasting the gorgeous Slovakian countryside. 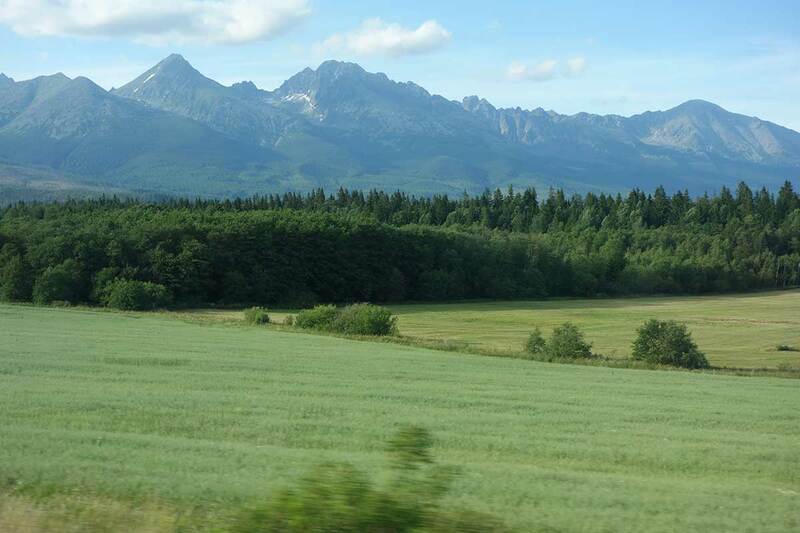 The region around is home to four national parks, the Tatra Mountains, the world-class Tokaj wine region and six UNESCO World Heritage Sites. 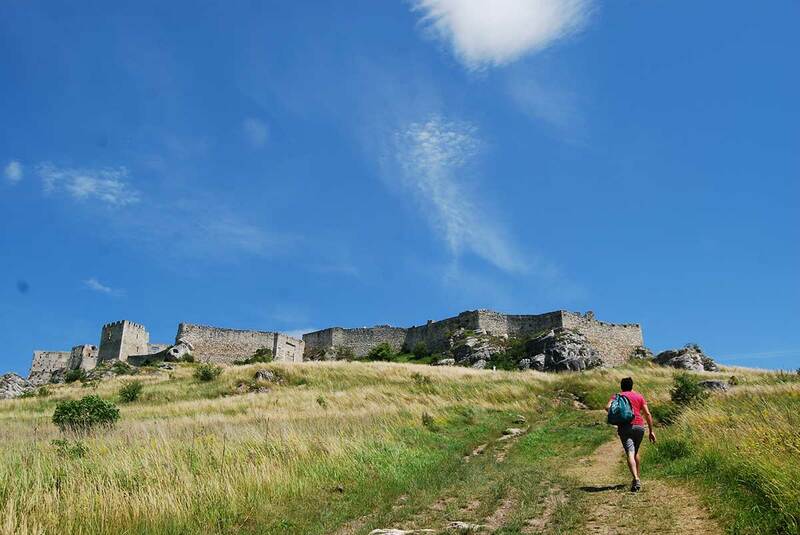 We chose one of the UNESCO sites, the Spiš Castle, which was easy to reach by public transport. This massive castle was built in the 12th century, regretfully for us, atop a hill. It was regretful because, in absence of other means of transport, we had to walk there from the little town at the foot of the hill—which still would have been okay if the sun hadn’t been scorching that day. Angeliki rightfully commented that we can’t have a single holiday without a hike, even when it’s unplanned. Have you ever seen such a perfectly kept lawn? Only in Košice. But the uphill trek at least allowed us to fully appreciate the beauty of the place: the dirt path sneaking its way through a sea of waving grass, red poppies sprouting in front of golden spikes of wheat, the bulky grey stone ramparts weighing on the green hill like a heavy silver crown. 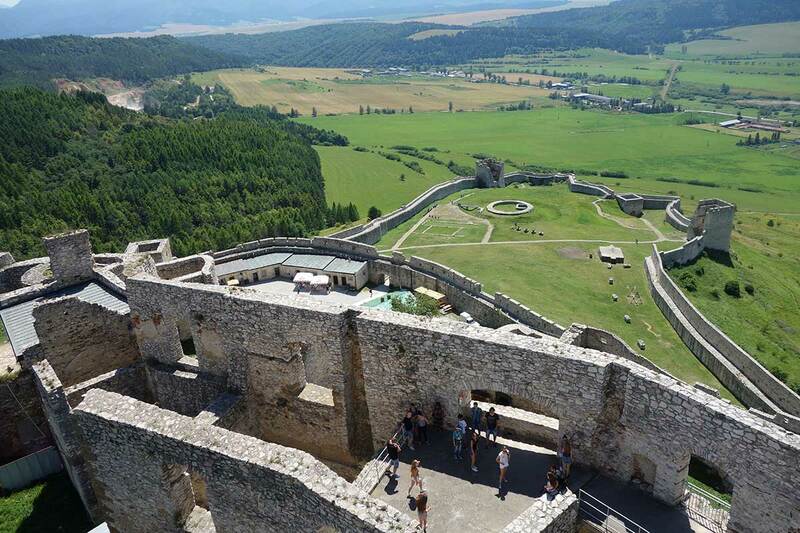 Only when we reached the top we truly realized how vast Spiš is—as we’d later learn, it’s one of Europe’s largest castles. Overlooking the farmlands beyond Košice from the 12th-century Spiš Castle. While the audio guide told us histories and legends of the fortress, we explored walls, towers, palaces and chapels; some crumbling, some still standing proudly in spite of time and neglect. Looking out from the turret, the spectacular view spanned over mountain ranges, forest-covered rolling hills, towns and fields in geometrical patterns. For a moment I imagined I was one of the kings the audio guide was talking about, watching an invading army march menacingly to storm the castle. But then Angeliki pinched my arm, waking me up from my daydream, and I felt relieved. Sometimes it’s good to be just a simple commoner.